Sector rotation in the US equity market over the past month has been driven by a combination of rising bond yields, stronger US economic growth and political risks going into Tuesday’s US Presidential and Congressional elections. 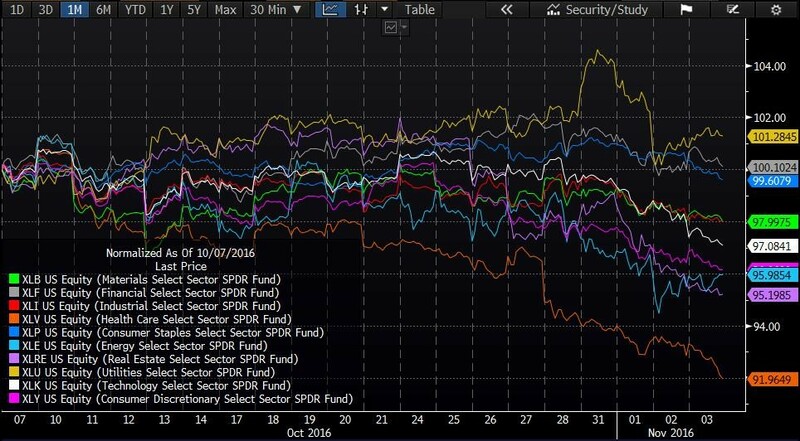 The chart shows the performance over the past month of the 10 sectors that comprise the S&P 500 index, all indexed to a common origin of 100. Only two US sectors are higher than where they were a month ago, namely Utilities and Financials, with Consumer Staples only slightly lower. With the whole US market down about 3% over that period, it is generally the defensive sectors that have held up best. In the case of US banks, they are in much better shape than their European counterparts and passed the Federal Reserve’s stress tests earlier in the year. They have also benefited from a steeper US yield curve. The worst performing sector has been Health Care, with politics from both sides being the main driver. Mrs Clinton’s policies would likely weigh on the performance of biotech and pharma stocks given her calls to lower prescription drug prices. Mr Trump’s stated desire to repeal the Affordable Care Act (commonly referred to as Obamacare) poses a risk to the healthcare providers and services industry. There is also a recent report that the US Department of Justice is widening its criminal investigation into generic pharmaceutical companies for suspected price collusion. The antitrust investigation began about two years ago and now spans more than a dozen companies and about two dozen drugs, according to some reports. That comes on top of public anger over the spiraling costs of some medicines and healthcare in general. The second-worst-performing sector in the US over the past month has been Real Estate, mainly due to rising bond yields as the market factors in a Fed tightening in December. The Energy sector has not performed much better, with recent oil price rises reversing now that the market has become increasingly skeptical of OPEC’s ability to deliver production cuts. The Consumer Discretionary sector has also slightly underperformed the market over the past month, indicating investor reluctance to embrace fully the idea of a cyclical upswing. Sectors such as Industrials, Materials and Technology have more or less traded in line with the market, falling 2-3% over the month. Sectors that are currently out of favour will not always remain so. Value investors know the importance of looking for opportunities in sectors left behind rather than chasing current trends. The woes of the US healthcare sector have affected healthcare stocks globally. With CSL currently trading below $99/share and likely to deliver double-digit EPS growth each year for the next three years, that stock could be a good example of such an opportunity. The outcome of this week’s Presidential election will be the main determinate of where the market goes in the short term. However, there is a tendency to overestimate the impact of politics on financial markets beyond the short term. Whichever candidate becomes the next President they will probably have to deal with a divided Congress, with Democrats likely to win back control of the Senate and Republicans likely to retain the House. That will limit what actions the new President will be able to take. The market fundamentals of earnings, interest rates and valuation will continue to be the main drivers of equity markets, irrespective of whoever becomes the next President of the United States.